The five element (or five phase theory) is used by many Shiatsu practitioners as a diagnostic tool to understand their clients physically, psychologically and spiritually. According to the Five Element theory, Chi (energy) can be subdivided into five different but interconnected phases: Fire, Earth, Metal, Water and Wood. As symbols of Nature, they relate to the energetic qualities of such things as the seasons, colors, flavors and emotions. Each element is associated with two meridians that are yin/yang partners. The elements follow the natural cycles of nature and each element is associated with a different time of day. Early on, this theory was a way of describing natural processes hidden from ordinary view. It became a school of thought during the Han Dynasty (202 BCE) to describe not only nature, but aesthetic principles, historic events, political structures, social norms, cosmology, mortality, and medicine. As described in the Internet Encyclopedia of Philosophy, these Five elements, phases, processes embody an dynamic inter dependant aspects of the Universe’s ongoing existence and development. “Mu” The Wood Element: The liver and gall bladder meridians are governed by the Wood element and is associated with initiating action and the energy of the morning. It gives the ability to plan, control and assert oneself. The emotion associated with it is anger. “Huo” The Fire Element: The fire element governs two meridian pairs : the heart and small intestine meridian, and the heart protector and the triple heater. This element is associated with the middle of the day when energy is at its peak. It represents our self-identity and celebration. The emotions associated with it are Joy and Love. element, which is associated with the late afternoon and a waning in activity. It relates to our ability to concentrate and analyse. The emotion associated with it is pensiveness. “Jin” The Metal Element: The lung and large intestine meridians are governed by the Metal element, which is associated with evening and a balance between activity and rest. It enables us to know our boundaries and when it is appropriate to take in and let go. The emotion associated with it is grief. “Shui” The Water Element: The kidney and bladder meridians are governed by the Water element, which is associated with night-time and rest. It provides us with the instinct for survival and procreation. The emotion associated with it is fear but this element is also the source of courage and endurance. Both The Dan Tien and San Jiao have no association with western anatomy. The Dan Tien and San Jiao are linked by more than their location. If the Qi in one of the three Jiao’s becomes disturbed so will the function of the Dan Tien located in that area. If one of the Dan Tien is disturbed so will the associated Jiao. The Dan Tien is literally translated as cinnabar field, or red field. According to the ancient Chinese theories, there are three Dan Tiens although the term is more often used to describe the lowest or most inferior of the three. located in the abdominal cavity three finger widths below and two finger widths behind the navel and corresponds with the physical centre of gravity. The Triple Heater manifests as the bodies waterways. The triple heater is primarily energetic and does not have a physical component, unlike all the other organs. San Jiao has been translated as “triple heater, and runs parallel with the Dan Tien. The San Jiao is also said to be a metabolism mechanism similar to an old-fashioned water wheel that is turned by incoming water and creates energy for accomplishing a task, such as grinding grain in the case of the water wheel, or for metabolizing and digesting food in the case of the San Jiao. The San Jiao is closely associated with the spleen functions of transformation and transportation, particularly the metabolism of incoming food. The San Jiao is also closely associated with the kidney’s function in TCM. The San Jiao is the Hand Shao Yang meridian and the Yang Ministerial Fire Organ. The San Jiao presides in the torso divided into upper, middle, and lower regions. Lower Dan Tien - located 1.3 inches below the navel and one inch in. It is also known as the golden stove, or the cauldron. It is associated with the endocrinal system. In Japan, this point is known as the Hara. Middle Dan Tien – located in the centre of the chest, level with the heart. It corresponds to the physiological functions of respiration and the circulation of blood and Qii. It also functions as the emotional centre of the body. Upper Dan Tien – located within the brain just behind a point directly between the eyebrows and corresponds to the Third Eye. It corresponds with the Shen and consciousness, as well as the physiological functioning of the brain and sensory organs. Lower San Jiao is below the naval, associated with the lower digestive organs of elimination and the reproductive organs. 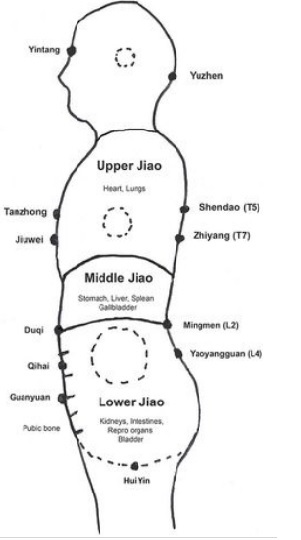 Middle San Jiao is located below the diaphragm and above the navel, associated with early and middle stage digestion. Upper San Jiao is located within the torso above the diaphragm, associated with the heart function and respiration.